The next Board member that I'd like to feature on the neXtPRIZE Blog is Dean Kamen. I've had the pleasure of meeting Dean Kamen once, when he came in to talk about some of his inventions, and how he's trying to change the world. Dean is a prolific inventor, and an advocate for science and technology. He's the founder of DEKA Research and Development Corporation. He holds more than 440 U.S. and foreign patents for innovative devices that have expanded the frontiers of health care worldwide. 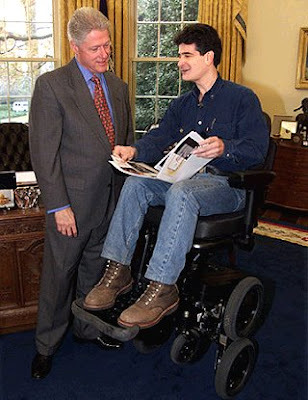 Some of his notable inventions include the first wearable insulin pump for diabetics, the HomeChoice™ portable peritoneal dialysis machine, the INDEPENDENCE® IBOT® Mobility System, and the Segway® Human Transporter. Many people have asked me "Why the Segway? How is that beneficial, other than to having fun?" Well, What many people don't know is that the technology that keeps the Segway upright was developed to create a wheelchair that can do the same thing, allowing handicapped people to rise up and have eye contact with people. Here's a picture of what I'd talking about, because I don't think I did a great job explaining. Dean also owns North Dumpling Island in the Long Island Sound, which he refers to as the "Kingodom of North Dumpling." Now, I don't know how accurate this is, but according to Wikipedia: "Kamen was initially denied permission to build a wind turbine on the island, so he joked that he was seceding from the United States, and later signed a non-aggression pact with his friend, then-President George H. W. Bush." Obviously the secession, if it actually happened, is not legally recognized. Does anyone know for sure? I understand that Dean has created a constitution, a flag, and a national anthem. He's also got a Navy (a single amphibious vehicle). All in all, Dean is a fascinating man who has done a number of great things for the world, and will continue to do so, I'm sure.